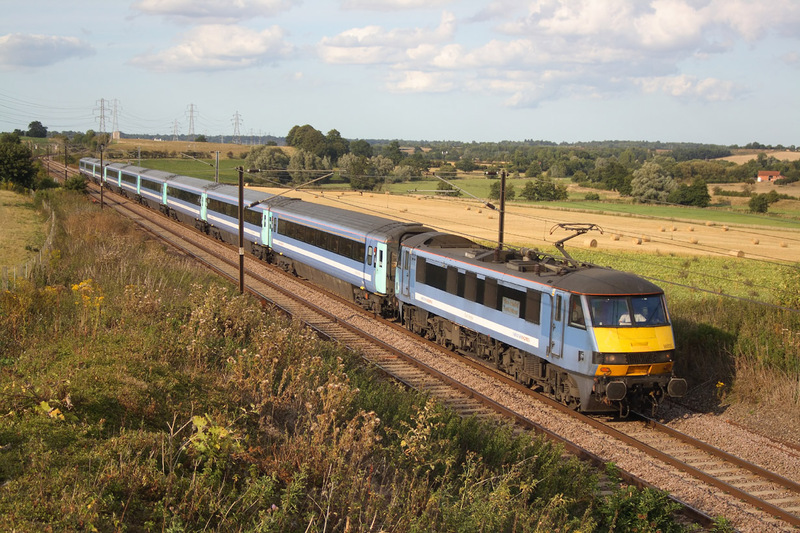 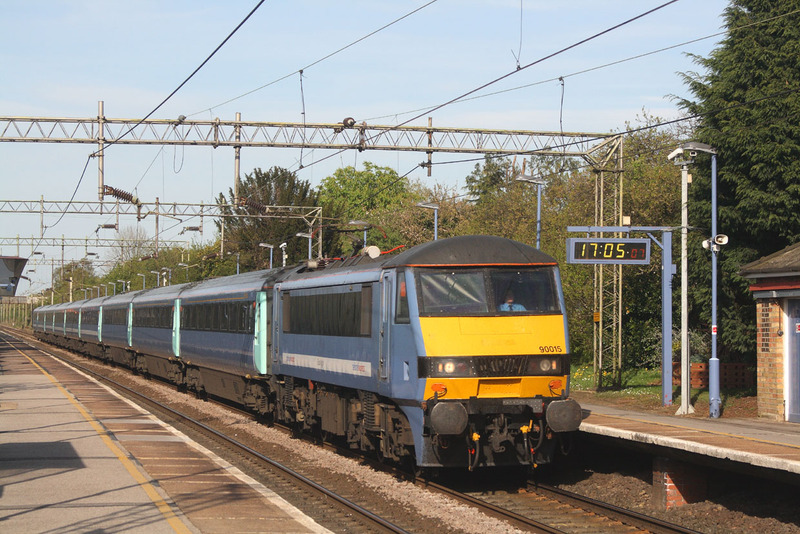 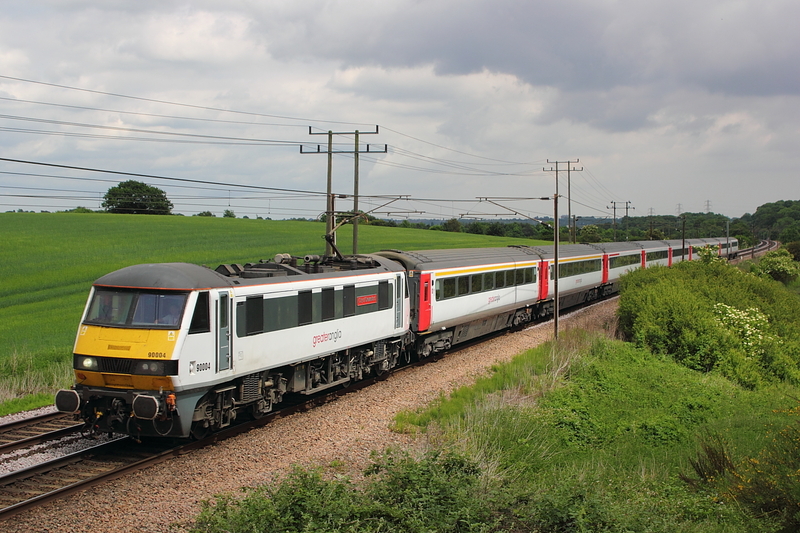 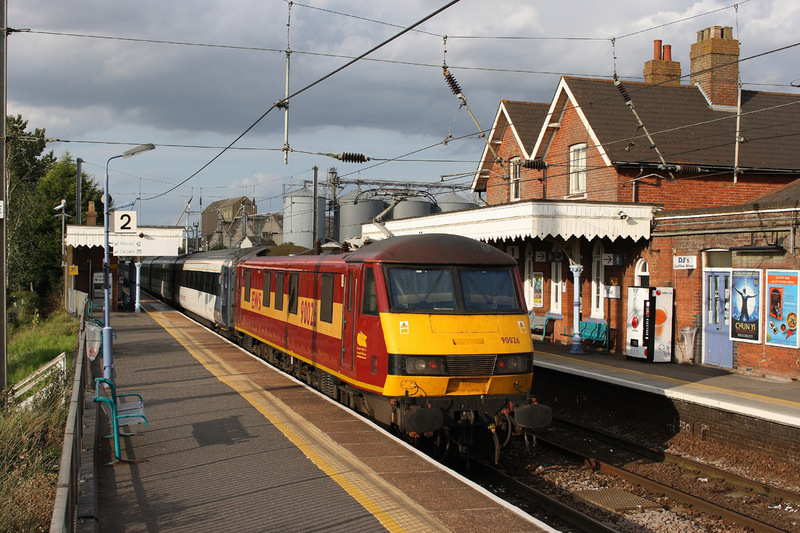 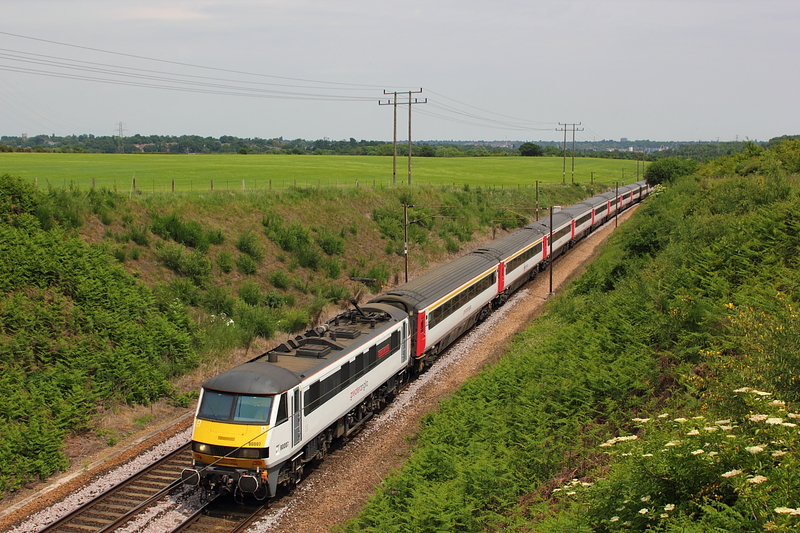 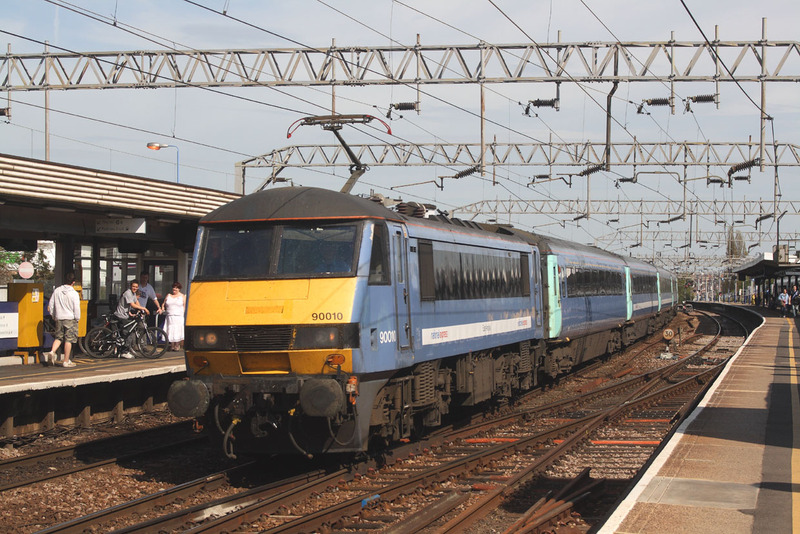 ​ 90012"Royal Anglian Regiment" 1P59 18.00 Norwich to London Liverpool St.
90001 "Crown Point" 1P33 11.30 Norwich to London Liverpool St.
90003 "Modern Railways Magazine" on a late 1P47 15.00 Norwich to London Liverpool St.
​ 90013 1P31 11.00 Norwich to London Liverpool St.
90011 "East Anglian Daily Times" sits at its destination at Norwich station having just arrived on 1P22 10.57 from London Liverpool St.
90007 "Sir John Betjeman" 12.00 Norwich to London Liverpool St.
90004"City of Chelmsford" 1p3512.00 12.00 Norwich to London Liverpool St.
90006"Roger Ford/Modern Railways Magazine"16.30 Norwich to London Liverpool St.
90001 Hammers through Ingatestone station on the 16.00 Norwich to London Liverpool St. service. 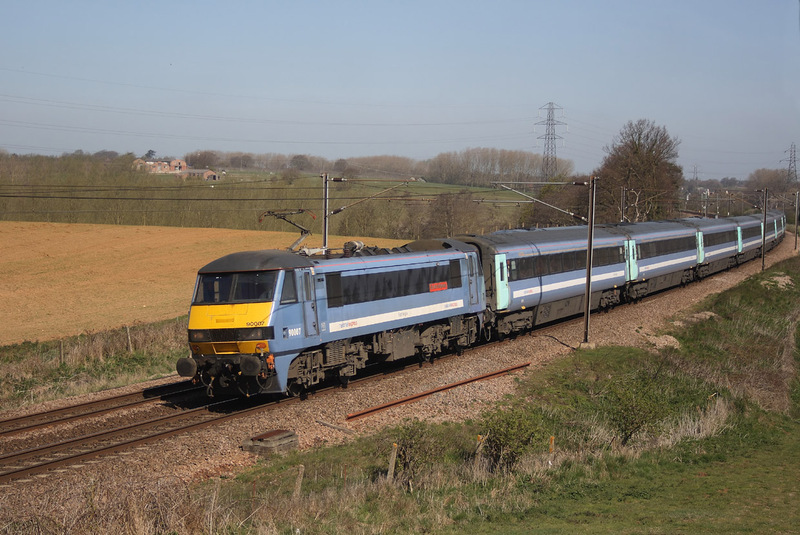 90003"Raedwald of East Anglia"15.30 Norwich to London Liverpool St.
A case of landing on your feet here.....after managing to move locations ,in the half hour servioce gap,without loss so far in the day,this was one of those locations ,seen from a road that had possabiltys,but you had to commit yourself to a walk across a field to suss it out. 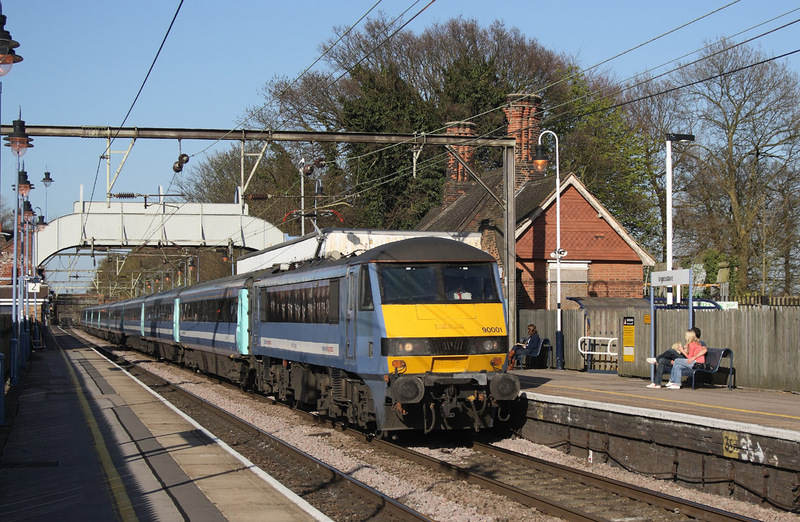 90010 passes Hatfield Peverel on the 14.00 Norwich to London Liverpool St.
90015"Colchester Castle" crosses Seven Arches,nr Colchester on the 13.30 Norwich to London Liverpool St.
90012"Royal Anglian Regiment"12.30 Norwich to London Liverpool St.
90006"Roger Ford/Modern Railways Magazine"..11.30 Norwich to London Liverpool St.
90015"Colchester Castle"11.00 London Liverpool St.to Norwich. 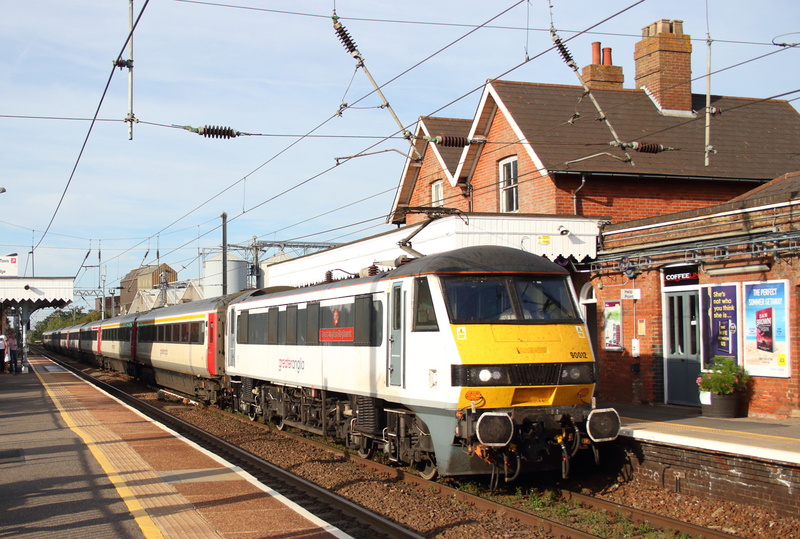 90003"Raedwald of East Anglia"10.30 Norwich to London Liverpool St.
90007"Sir John Betjeman"10.00 Norwich to London Liverpool St.
90004..09.30 Norwich to London Liverpool St.
90026 on the rear of the 16.30 London Liverpool St. to Norwich service. 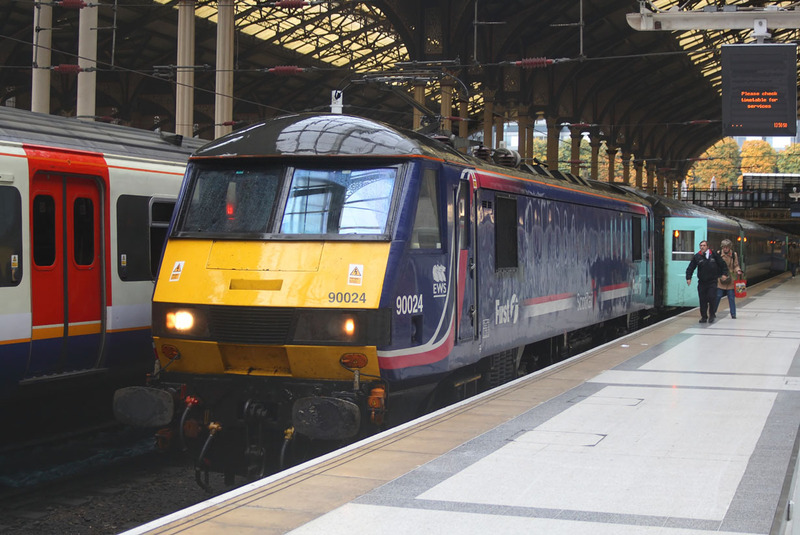 90005"Vice Admiral Lord Nelson"17.30 Norwich to Liverpool St.
With plenty off "Jobs Worth" at Liverpool St. Station it was a case of a grab shot of 90024 which had worked in on 1P33,the 12.42 from Ipswich,and would prove to be the only 90 diagram on the day due to a engineering blockade at Stowmarket. 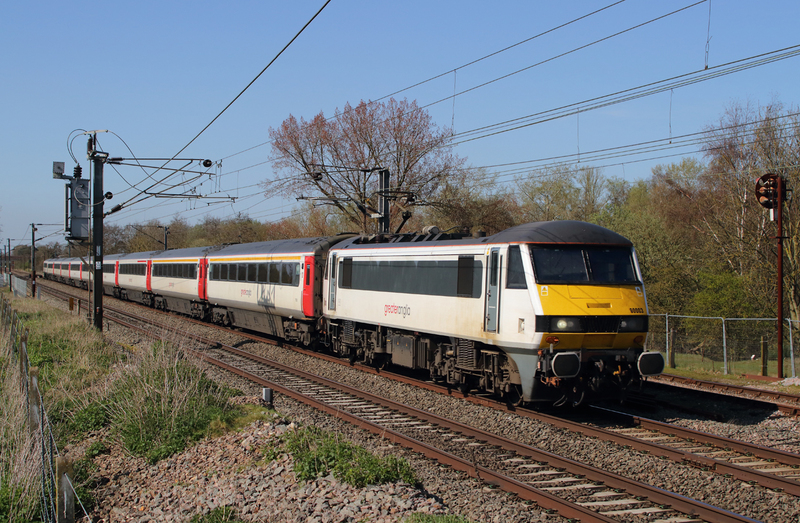 90015..1P47..15.30 Norwich to Liverpool St.
90003"Raedwald" 1P45..15.00 Norwich to Liverpool St.
90008..1P38..15.00 Liverpool St to Norwich. 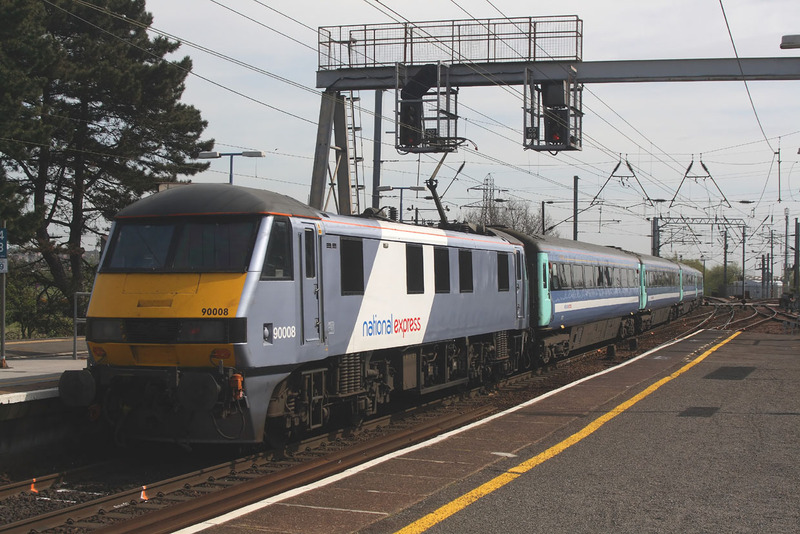 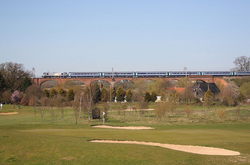 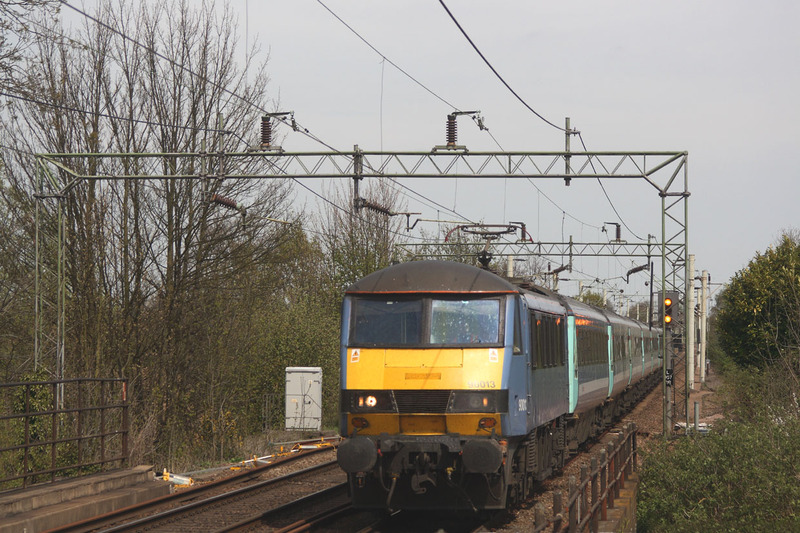 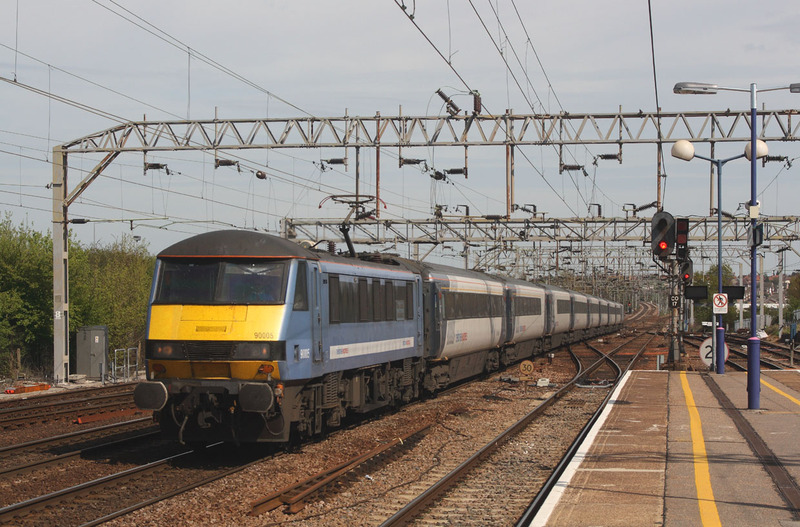 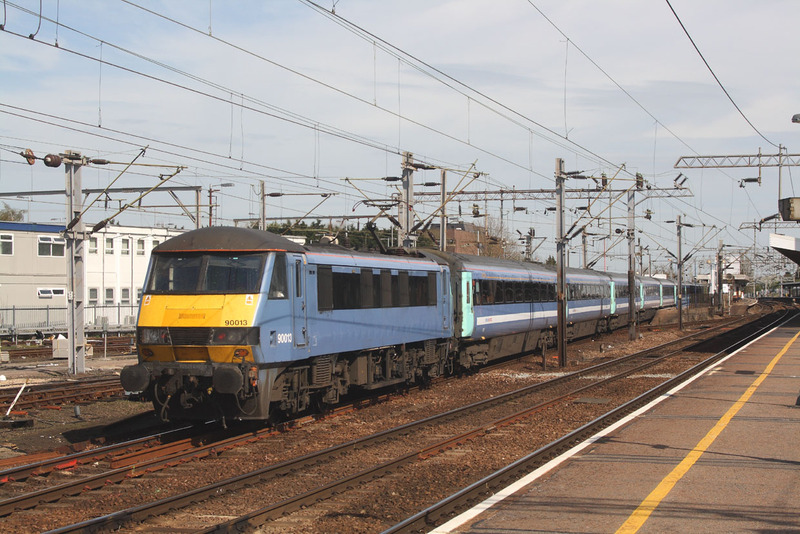 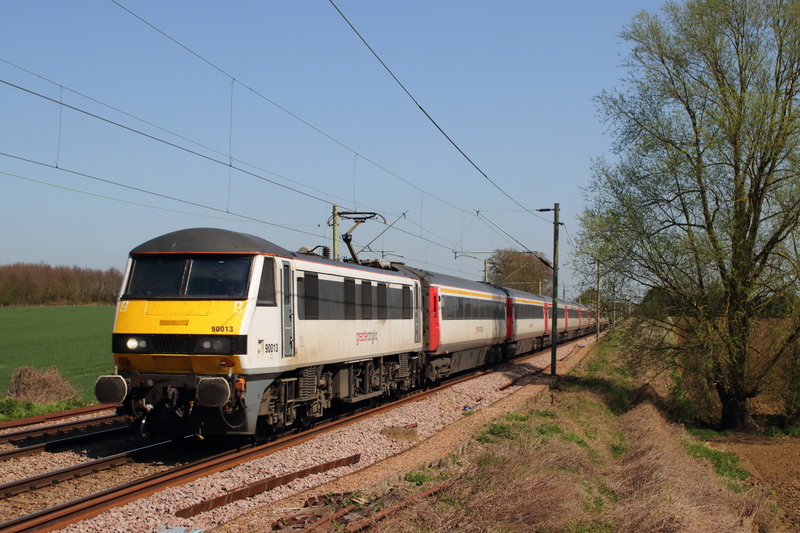 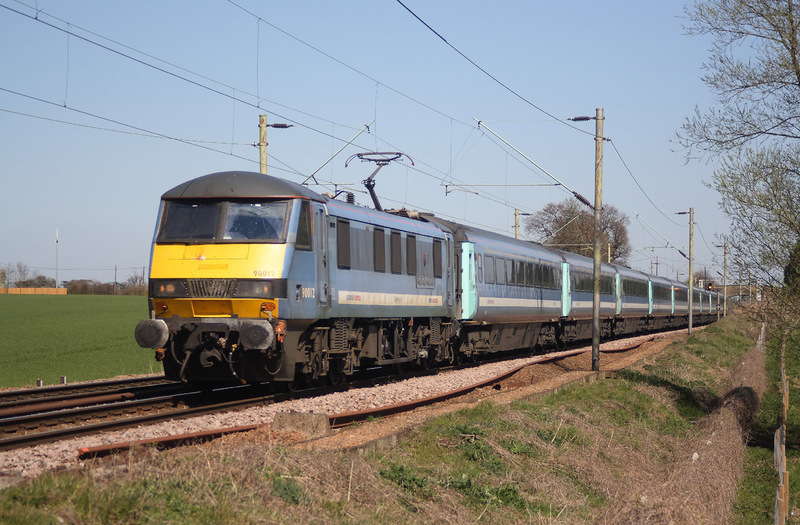 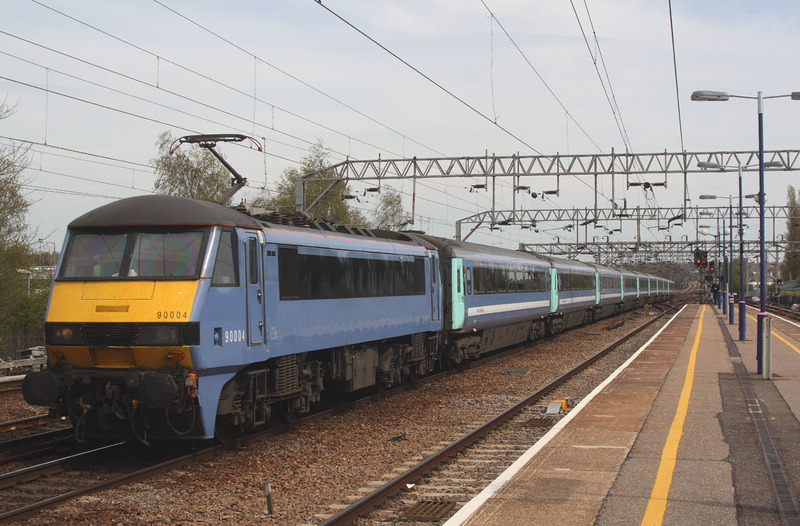 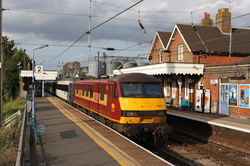 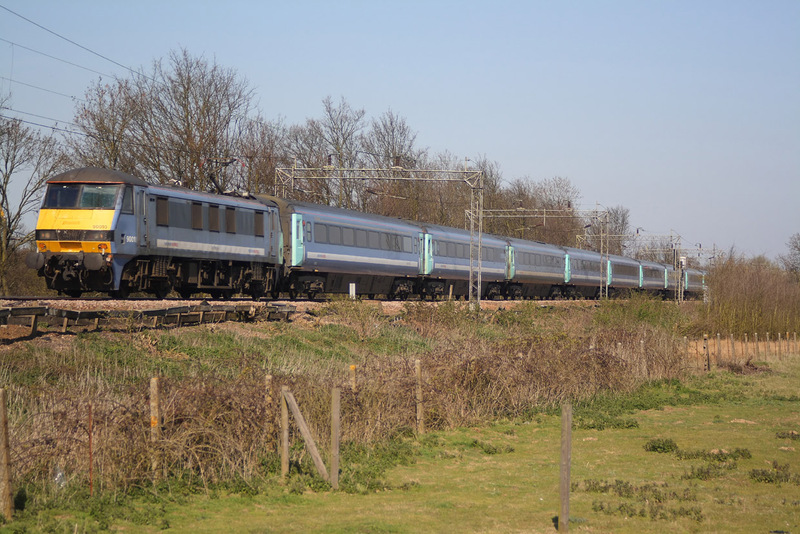 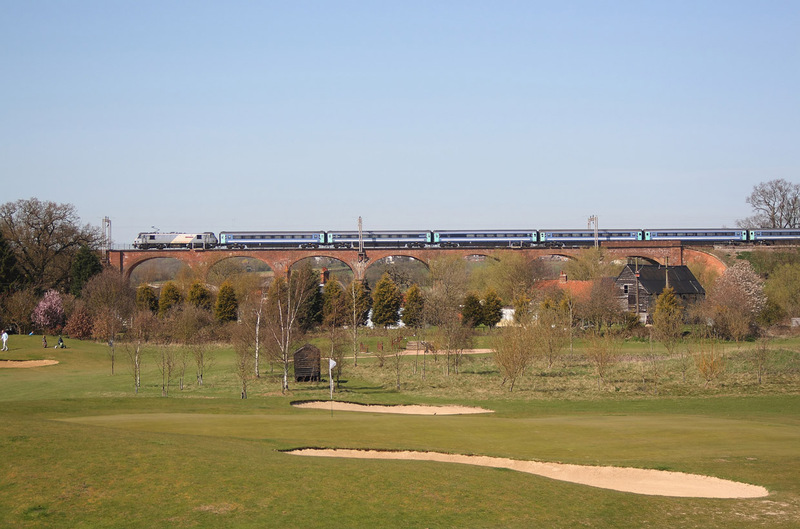 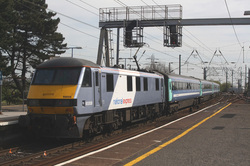 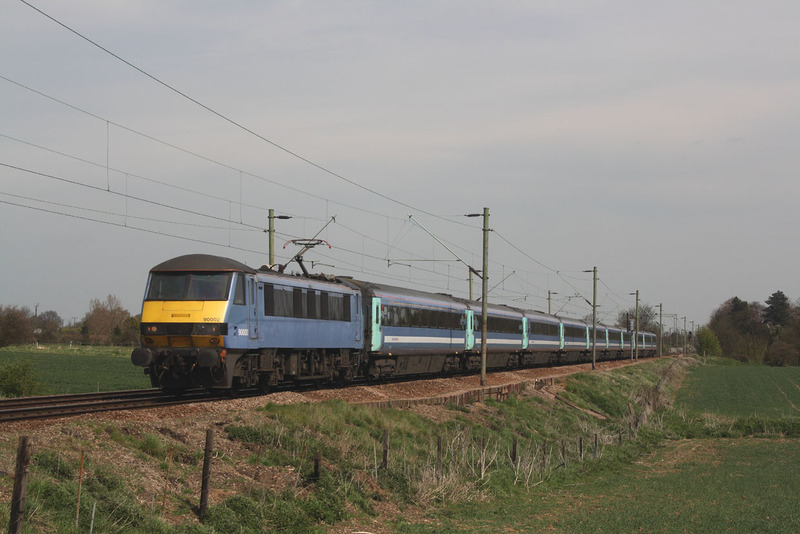 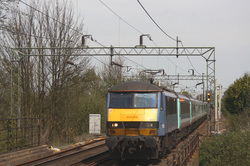 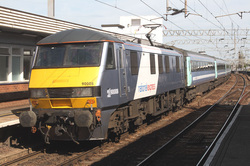 90010..1P43..14.30 Norwich to Liverpool St.
90013..1P36..14.30 Liverpool St to Norwich. 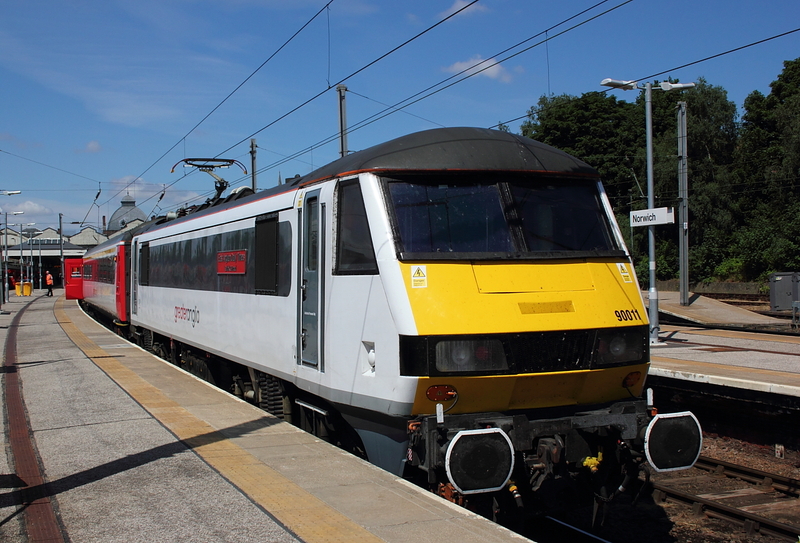 90005..1P41..14.00 Norwich to Liverpool St.
90001..1P39..13.30 Norwich to Liverpool St.
90012"Royal Anglian Regiment"1P32..13.30 Liverpool St. to Norwich. 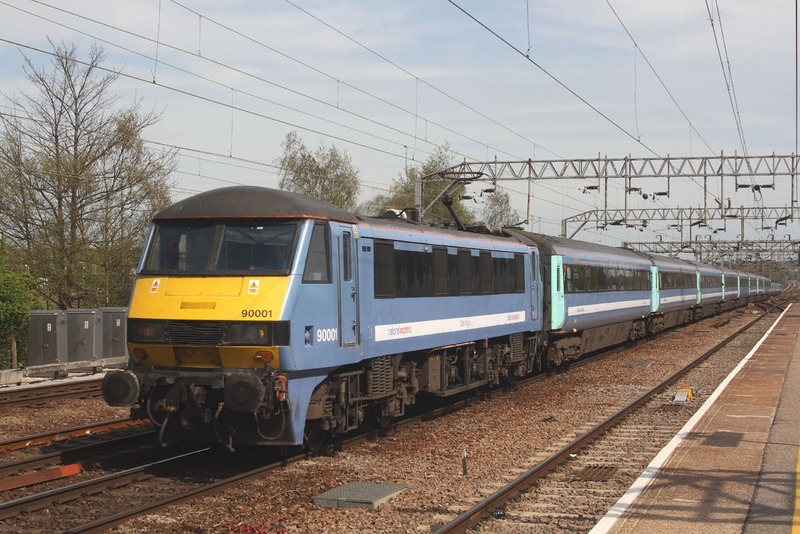 90004..1P37..13.00 Norwich to Liverpool St.
900013..1P33..12.00 Norwich to Liverpool St.
90002..1P31..11.30 Norwich to Liverpool St.
90012"Royal Anglian Regiment"1P29..11.00 Norwich to Liverpool St.
90008..1P18..10.00 Liverpool St. to Norwich. 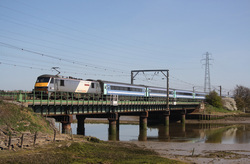 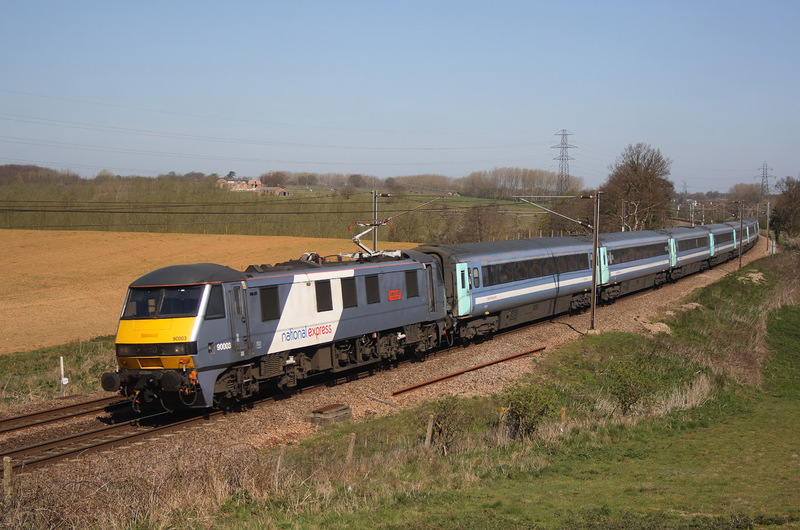 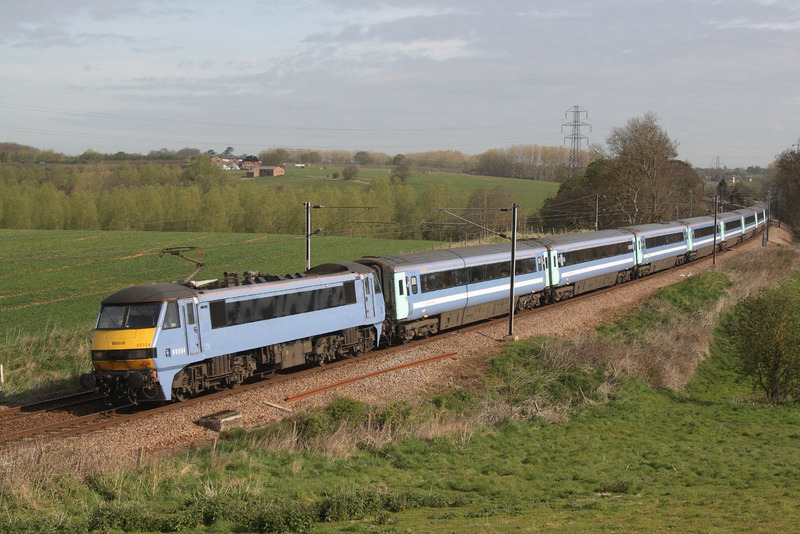 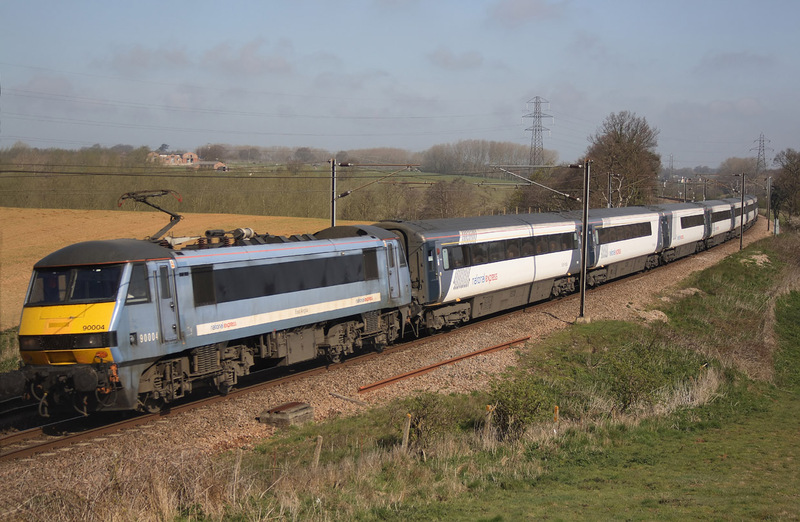 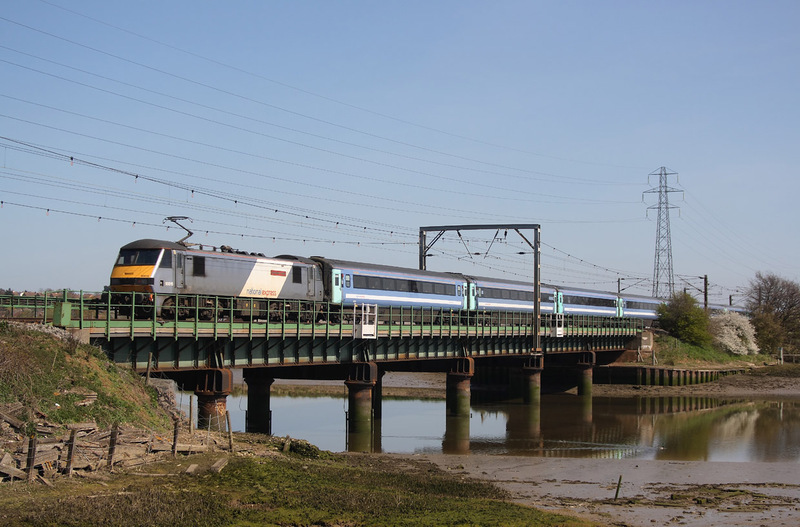 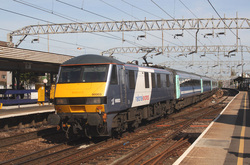 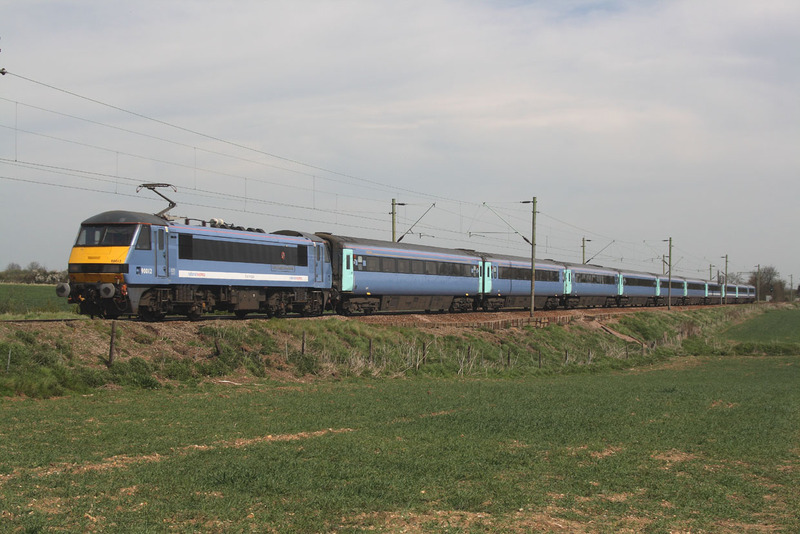 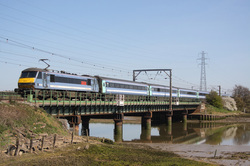 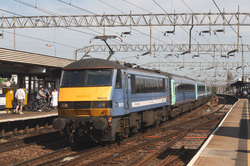 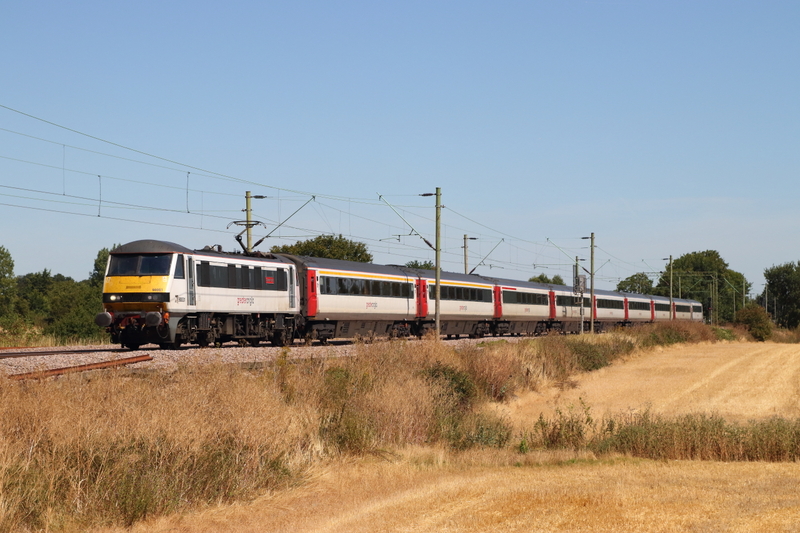 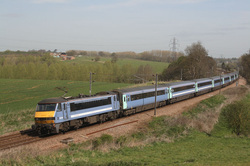 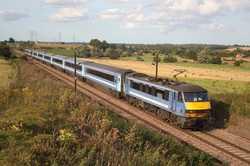 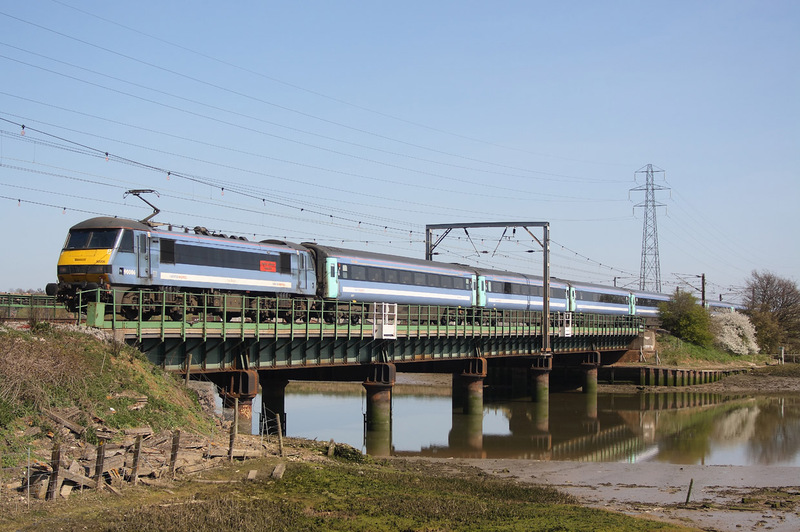 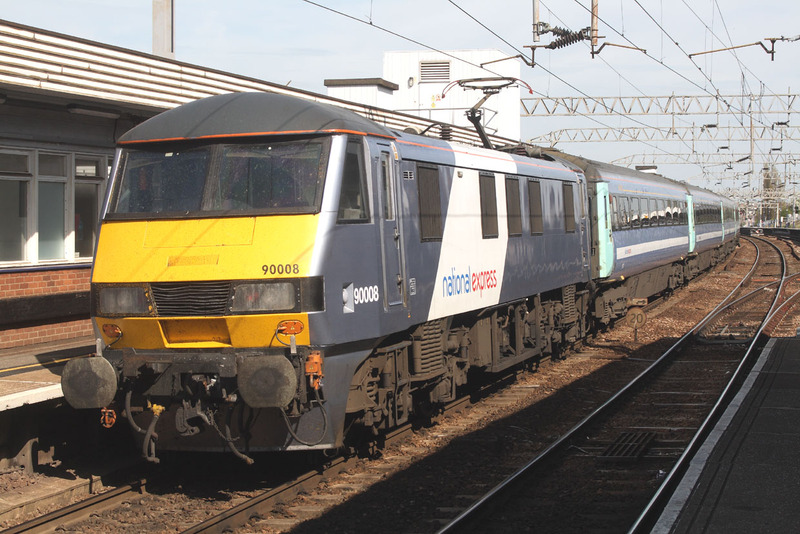 90010..1P23..09.30 Norwich to Liverpool St.
90004..1P17..08.00 Norwich to Liverpool St.